(Bloomberg) -- Staying away from stocks this year might not have been such a great idea after all. The S&P 500 is just 2.2 percent away from a record high. The Stoxx Europe 600 Index is trading at the highest since August, and both car stocks and Italy’s FTSE MIB are set to close in a bull market today. 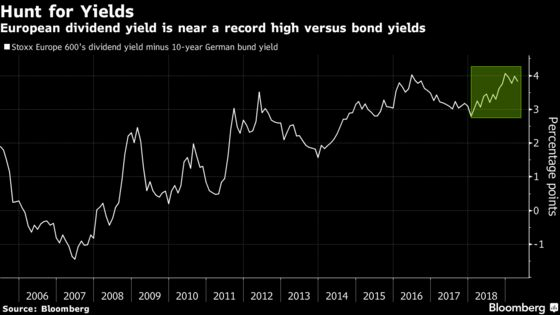 The German bund yield is dipping below zero, fueling appetite for risk assets. And the latest Euro-area services data shows resilience. What’s making strategists, including those at Barclays Plc, optimistic that this rally can keep going is that investors continue to avoid equities and are bracing for the worst-case scenario. Global stocks are up 14 percent this year, but a $79 billion exodus from equity funds and reduction of exposure to a 2016 low spells out a rally that is extremely low-conviction. 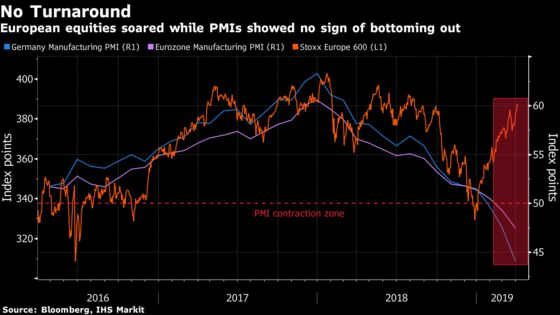 There was a good reason for investors to be under-invested in European equities: manufacturing activity was weakening. The surprising part is that stocks have almost erased their 2018 losses. 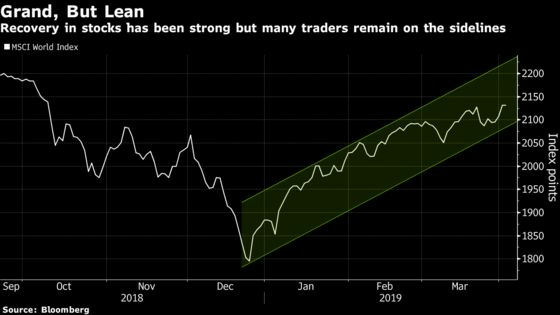 “No one appears to be positioned for good news, and the pain trade still looks to be on the upside,” said Barclays strategists, including Emmanuel Cau, in a note on Wednesday. “We continue to find the risk-reward for equities more attractive than for bonds." Traders continue to hide in cash and bonds as the factors that fueled the gains in stocks -- softer monetary policy and optimism over a U.S.-China trade deal -- are fluid and can turn against the market. This is why Guillermo Hernandez Sampere, head of trading at German asset manager MPPM EK, prefers to invest in stocks but keeps some cash in case things go south. Short-covering was the main driver of this year’s equity bounce, according to Barclays, and macro hedge funds remain long bonds and short equities.